Photo courtesy of Pottery Barn. 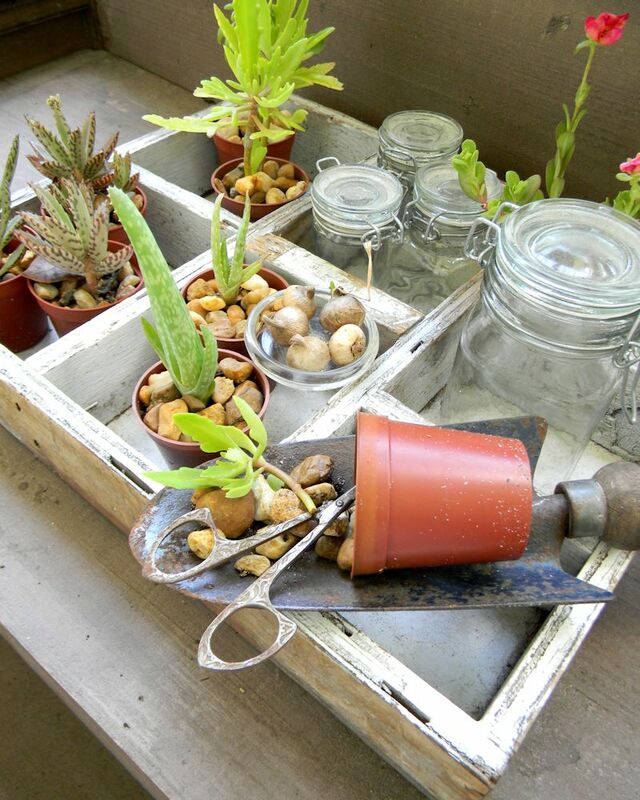 Our decorating diva Melinda Graham shares some ideas for using recycled accessories in your potting space. 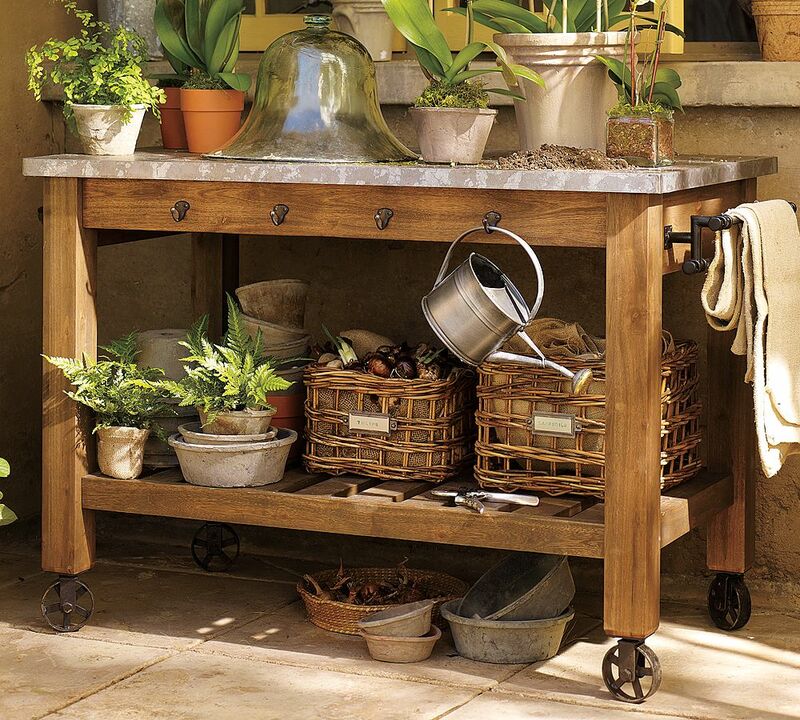 Potting benches have their own charming yet functional style. Practically rustic by design, they blend effortlessly with vintage wares. So why not dedicate a little time and energy to organizing your potting bench on a budget by upcycling thrift shop and flea market finds into stylish forms of organization. Look for casual or industrial wares that will withstand the outdoor elements while organizing the clutter and adding a creative touch to your garden. All photos courtesy of and copyright by Surroundings By Melinda. 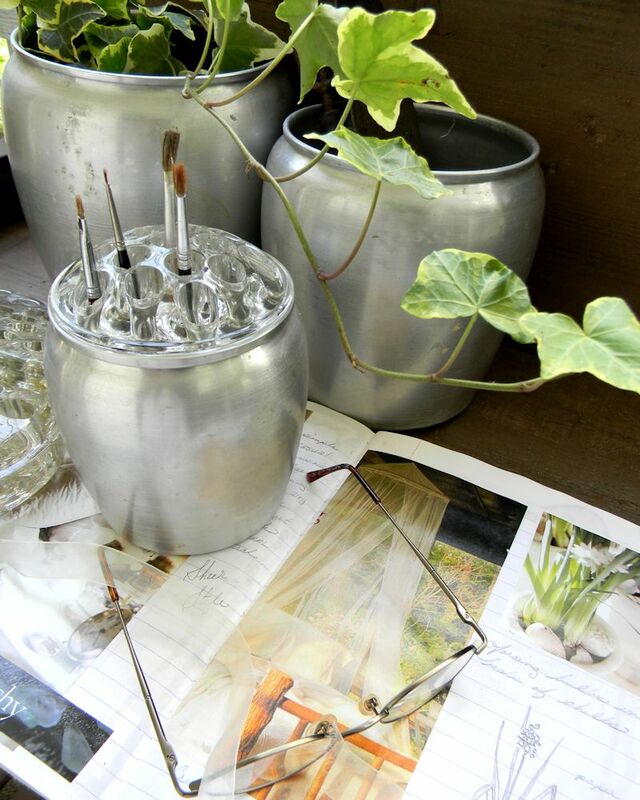 Old tin canisters may seem to be useless once the lids have disappeared, but give them a new purpose as ways to protect new plants, corral small garden tools or organize paint brushes and writing instrumentss—with the help of a vintage glass frog placed on top. Give old divided wooden drawers a new life by tasking them to separate young (and top-heavy) seedlings or to hold tiny glass jars of seeds and other work surface clutter. An old insert tool box insert makes and excellent garden caddy. 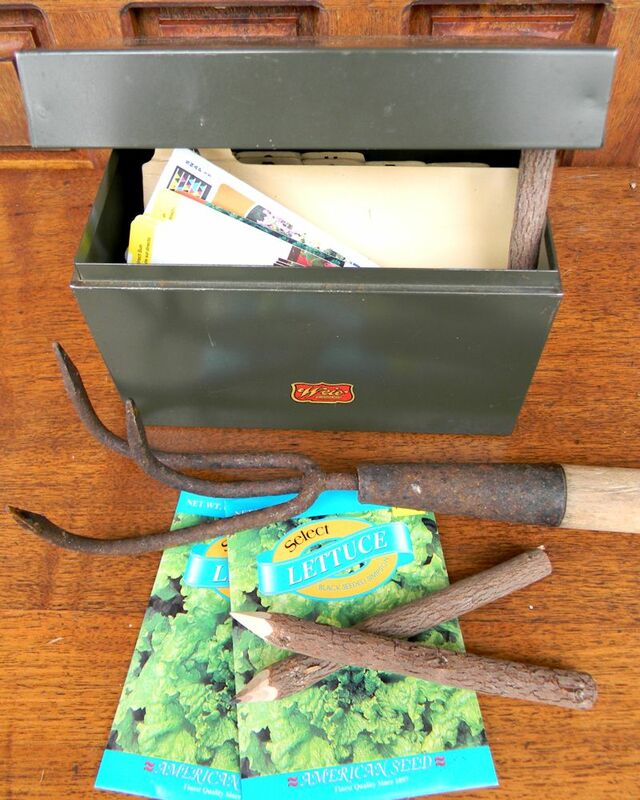 It is the perfect place to gather pens, plant labels, twine and scissors, keeping everything you need organized in one little tray that’s easy to be carried around the garden while you work. 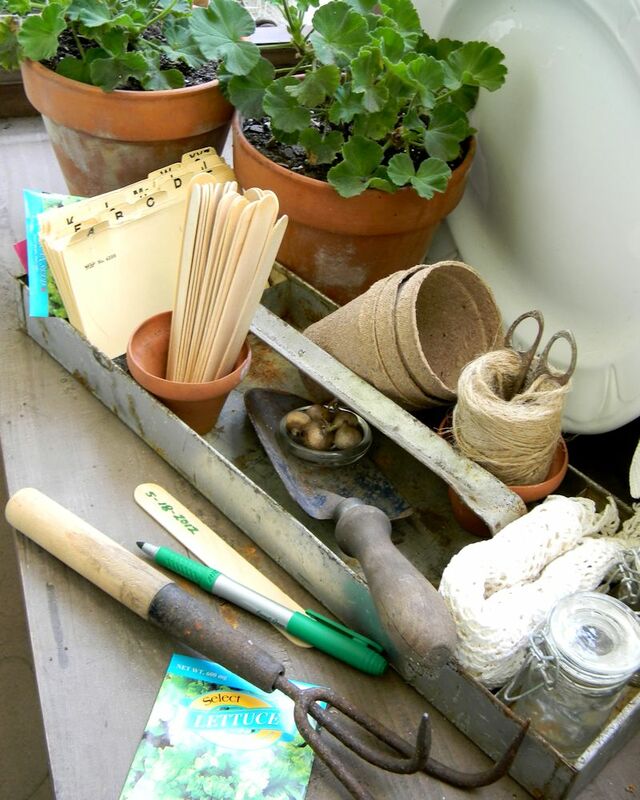 You may not even need to go picking to find items to organize your potting bench. Here are a few items you just might have hiding around the house right now. Once old muffin tins lose their non-stick coating or start to rust, take them out to the garden instead of tossing them in the trash. Just wash them then spray with a light protective coat of clear polyurethane. Once dry, they are ready to go back to work as trays for new seedlings. The popularity of the the Web has cause many people to do away with most paper files, leaving many filing cabinets, storage boxes and index card holder out of work. Well, these small metal boxes are an excellent place to store plant markers and information cards, allowing you to keep track of when and where plants were purchased and keep growing guidelines for each plant right at your fingertips. Most glass jars hit the recycle bin the second the contents are gone. 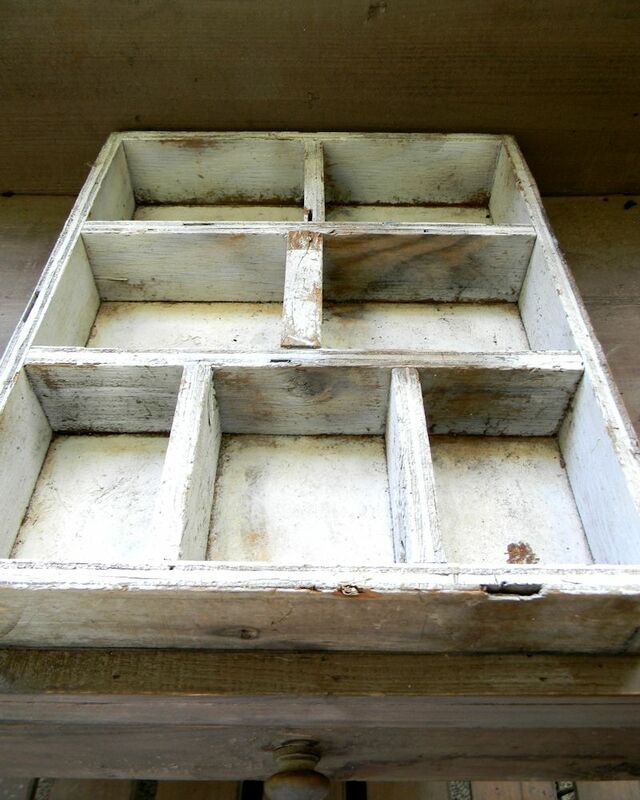 But these old containers are a beautiful way to store, protect and enjoy harvested seeds from the garden. Label them and wait for the end of next planting season. I hope this inspires you to not only organize your potting area but to see recycling with an imaginative eye. It doesn’t take a lot of money or even a great deal of time. All you need is a little creative thinking. For more decorating ideas, visit the Surroundings By Melinda Blog. This entry was posted in Decor, Garden Decor, Uncategorized and tagged decor, decorating, flea market, garden, garden accessories, gardening, interior design, Melinda Graham, outdoor, potting bench, recycling, Surroundings by Melinda, thrift store, upcycling. Bookmark the permalink.